During our recent stay in Chiang Mai we had decided to make the most of the opportunities to explore all the foodie delights of Thailands second city. We had attended an awesome cooking class hosted by the Thai Akha Cooking School. But we also wanted to find our food bearings in a culinary culture that is so different to Europe. Because we were really happy with the cooking school experience, we decided to attend the market tour in Chiang Mai, which was organized by the same company. Do you want to learn to cook Thai dishes in Chiang Mai? Then check out our post about the Thai Akha Cooking School! At the time of writing, Thai Akha Cooking School were the only company offering a market food tour in Chiang Mai Thailand. 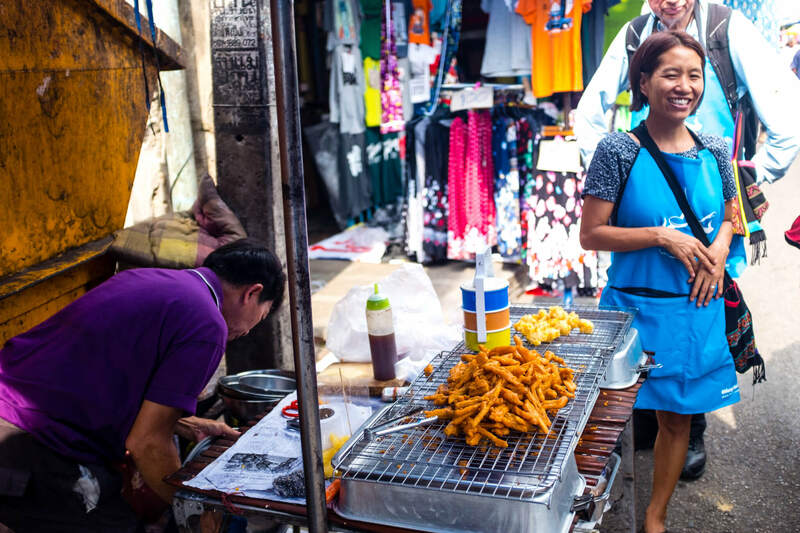 There are many offers for Thailand street food tours, but no others for a local market tour. The difference with a market tour is that you can learn not only about the dishes but also about the fresh ingredients you will find in a typical local market in Chiang Mai. We started our morning market tour at the south entrance of the Bumrung Buri market, one of the best markets in Chiang Mai, situated near the Chiang Mai gate. There we met Niti, who would be our guide for the day. Before we entered the actual Chiang Mai gate market, she showed us the area just in front, which is one of the few local breakfast places to eat in Chiang Mai. Breakfast in Thailand is quite different from what I was used in Switzerland. In the western hemisphere, you often have many specific breakfast dishes but it’s a bit different in Thailand. Most of the time you just eat similar dishes to those you would eat for lunch or dinner. The few dishes that are considered as breakfast dishes, like for example the rice porridge called “Joke”, can also be found at any other time of the day. After Niti showed us what is available on the various food stalls and what the local Thai people normally have for breakfast, we all sat at a table and ate breakfast together. Without wanting to spoil too much, I can tell you that a traditional Thai breakfast is definitely not your usual everyday Western-style breakfast. Also, that it tastes a whole lot better than it looks! My tip is to try the coffee and the egg drink. It wakes you up and gives you energy for the Chiang Mai food tour to come. Also, if you feel daring, have a go at the pink “Century Egg”. It might not look very mouthwatering, but it tastes ok. It’s one of the Chiang Mai must eat items – an experience by itself, especially once you know how it is made! After a hearty breakfast, Niti, our Chiang Mai food guide, gave all of us aprons and a traditional Akha shoulder bag with a lunchbox in it. The lunchbox is a great idea – it saves the use of plastic bags for the food we would buy on the tour. The next stop on our program was to start exploring the Bumrung Buri market. The first area we visited was the fresh fruit and vegetable section of the market. Niri showed us lots of different veggies and fruit I had personally never seen in my life before and she shared with us some information about the Thai market culture. Whenever we wanted to try any of the market food, Niti would buy some and give it to us to taste while explaining what it is and what it is used for. I really loved this food tasting experience because you can try different foods you’d never usually buy when you are on your own in a market. While our guide encouraged us to try a lot of new things, she never pushed anyone to try anything they didn’t want to eat. At the corner of the fruit and vegetable part of the food market Chiang Mai we saw one of my favourite Thai snacks being made freshly: deep-fried pork skin, called Kap Moo in Thai. Although it might not be the healthiest snack ever, it is super delicious and definitely a contender for our best Thai food in Chiang Mai! Get some chili sauce and dunk those little delicacies in it to experience one of the favourite snacks of the locals in Chiang Mai. We tried some spicy Chiang Mai chilies on the next stall. Be warned – they are “Thai spicy”, which means hot hot hot!! After this, we ventured on with our gourmet tour to the meat section of the market. Niti gave us again a lot of great information about the local customs. She explained to us that Thai people usually only eat a small amount of meat. Because of this, you will only find about 4-6 pieces of meat in a traditional Thai dish. The highlight of this part was definitely that we had the chance to try a snack made with pork brain. You may flinch, but I always love to try new foods so I just HAD to try this. It was actually really delicious and didn’t wake up any hidden zombie tendencies within me. If you haven’t tried it then you can imagine it as kind of a spicy minced meat snack. Are you interested in doing this tour as well? Then you can book it right here! With our newly gained knowledge, we continued to the part of the Chiang Mai food market where you can get the ready-cooked dishes. As we planned to eat lunch together in a park, we gathered many different dishes to share later. Basically, as soon as we saw something interesting, we told Niti and she would explain to us what it is. That way we collected quite a variety of traditional authentic Thai dishes, including some yummy desserts like colourful sticky rice and stinky durian. In my opinion, you can get some of the best food in Chiang Mai in local markets like this one. Make sure to check out our post about the best street food in Asia if you’re also a fan of street cuisine. After this awesome Chiang Mai market tour, we strolled with our fresh Chiang Mai food to the Nong Buak Hard Park in the southwestern corner of Chiang Mai Old Town. When we arrived in the park we all sat together on one table and spread out all the delicious food we had bought in the local Chiang Mai market. One of my favourite dishes was deep-fried pork tail. The skin was fried and crispy, but the meat underneath was super soft and exceptionally tasty. Pork tail is not always available, but if it is then my tip is to try to get yourself some, you won’t regret it! We both really enjoyed this market tour in Chiang Mai. You can try almost whatever you want and get information about the ingredients and how the dishes are eaten. This is a great way to try market food you may not dare to if you were to visit a local market by yourself. The local Thai market tour in Chiang Mai gives confidence to just buy food the way the locals do. It also gives you a deeper understanding of Thai food culture and how the locals enjoy their food in Chiang Mai. We can recommend this trip to anyone with a love of food and culture who is visiting Chiang Mai. For us, it was one of the highlights of our Chiang Mai trip and our guide Niti was simply fantastic! Did you like this article? Was it useful for you? Then please share it on your Pinterest wall! If you want to know more about the tour or you even want to book it, then check out the official webpage here. The market tour in Chiang Mai was a fantastic experience! Planning to go to Thailand soon? Then you might be interested in our other Thailand posts! Or if you just enjoy our foodie travel experiences, then click here to read all posts in our Food category. Disclosure: We were kindly invited to experience the services of the Thai Akha Cooking School in exchange for an honest review. All words and opinions are our own.